As in other historic cities, markets have always had a very important role in Madrid. Today we will focus on three of the most representative, and that are in the environment of El Anciano Rey. The market of La Cebada. It was built on land that was used to store the barley for the King’s stables. In the 18th century it was already one of the most important markets, and in the 19th century the architect Mariano Calvo y Pereira designed a new iron and glass market that was inaugurated by King Alfonso XII. Unfortunately the building deteriorated in such a way that it had to be demolished in 1956. A couple of years later, the market we see today was built, where a mural on the main monuments of Madrid by Madrid artist Carlos Rincon stands out in 1962. Although in 2009 it was thought to knock it down again, it was finally transformed into the “Campo de la Cebada”, a space where concerts, exhibitions, etc. are held. The market of San Miguel. It was created as an open-air market next to the church of San Miguel. When José Bonaparte acceded to the throne, the church was demolished, leaving in its place a public square that functioned as a market. In 1911, a new building was begun and finished on May 13, 1916. After many vicissitudes, in 2009 the market reopened more as a space of restoration than as a market as such. For that reason at present there are hardly any stalls, being mostly bars and restaurants. Finally we will refer to the market of San Ildefonso, which was built in 1835 to solve the problems caused by the outdoor market that took place there since the 17th century. 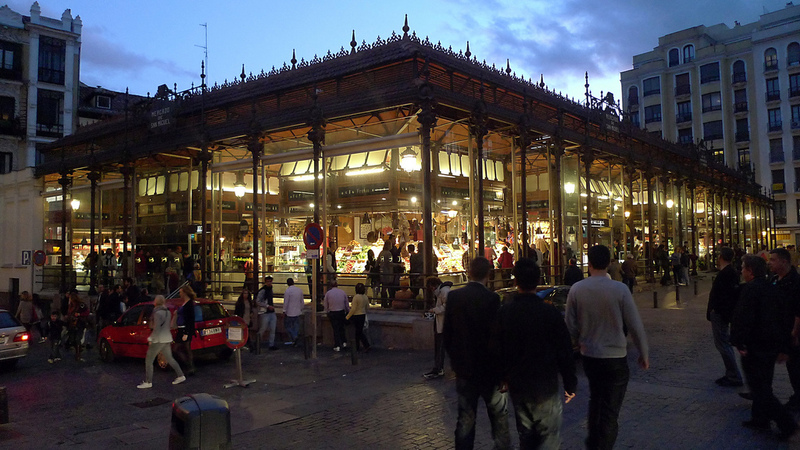 In fact, it was the first covered market in Madrid. The market worked until 1970 when it was demolished to recover the old square. Thus, the new market appears in 2014, inspired by the street markets of London or New York. If now you want to know these spaces firsthand, it is best to first go through El Anciano Rey, where you can plan your visit in front of a good wine or a natural vermouth.